Today we walked across the Bridge Of The Gods in Cascade Locks, OR to finish our hike of the Oregon section of the Pacific Crest Trail. Deb (AKA aFloat) has now hiked 2,144 miles of the PCT counting her hike across California in 2014. I have now hiked across Oregon three times on the PCT and each time the trail has had a different look and feel because of snow, rain, and fire conditions. Oregon has been great hiking but the unseasonably warm weather and smoke from the many wildfires made the hiking this year just a bit less pleasant than normal. The late snow thaw kept the trail blocked by some very big downed trees forcing some creative hiker get-arounds. Wildlife encounters were rare, but still special. The berries never made an appearance until the final days and they are sparse and unripe as yet. 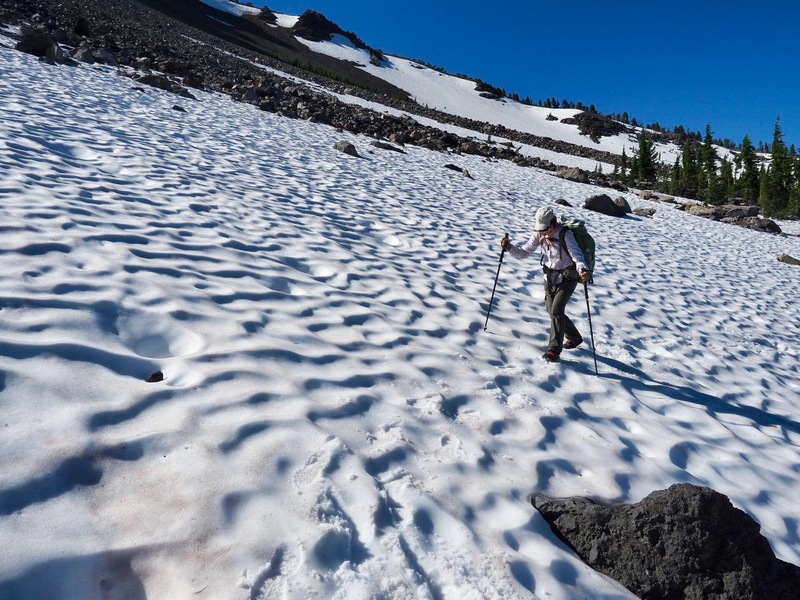 We are elated to have finished the state but have mixed feelings about what we missed: the snow fields of Diamond Peak and the (non-PCT) Eagle Creek portion. However, everyone hikes their own hike and so did we. And we can live with our decisions quite happily. A helicopter fighting the Whitewater fire near Jefferson Park. We arrived in Olallie Lake Resort and are now down to the final 100 miles of our 430 mile hike across Oregon on the Pacific Crest Trail. Walking only 100 miles more feels a little like we are practically done, or at least this hike is winding down to its final stage. We can see snowy Mount Hood looming large ahead. It’s the last large mountain in Oregon. Mount Hood is 11,200 feet tall, but the PCT only briefly climbs to 6,000 feet as it traverses around the mountain. Snow should not be a problem this late, even in this high snow year. This past week has been interesting hiking. We hiked for miles across lava fields near McKenzie Pass. We climbed part way up and around Three Fingered Jack. We hike around Jefferson Peak and through beautiful Jefferson Park. Near Jefferson Peak we encountered the Whitewater Wildfire burning about a mile from the PCT. We watched as three firefighting helicopters flew overhead scooping up water from lakes in Jefferson Park and dumping it on the fire. As we reached Olallie Lake Resort we noticed looking back the smoke from the wildfire seemed greater than when we passed the day before. Then we learned that the Forest Service would be closing the PCT near Jefferson Peak this morning because of the fire. We made it past this fire closure with about 24 hours to spare. We feel bad for the hikers behind us caught up in this trail closure. The Three Sisters Wilderness is an amazing section of the Pacific Crest Trail. When I hiked this section on my 2014 thru-hike I experienced several days of heavy rain and almost never saw the mountains. This trip the weather has been perfect, wildflowers are blooming everywhere, and the snow covered Three Sisters mountains dominate the skyline 4,000 feet above. Water has been plentiful, the trail is almost snow free, and the camping excellent. We can see several mountains on the horizon that we will be approaching soon. Three Fingered Jack, Mount Jefferson, and off in the distance Mount Hood. Several southbound hikers have reported snow is not an issue to the north. Every hiker has a different idea of what easy snow is. What’s easy to a guy that has been guiding on Mount Rainer the past five years is probably different for us. One of the hikers said she hates snow and didn’t find it difficult, so we are encouraged. 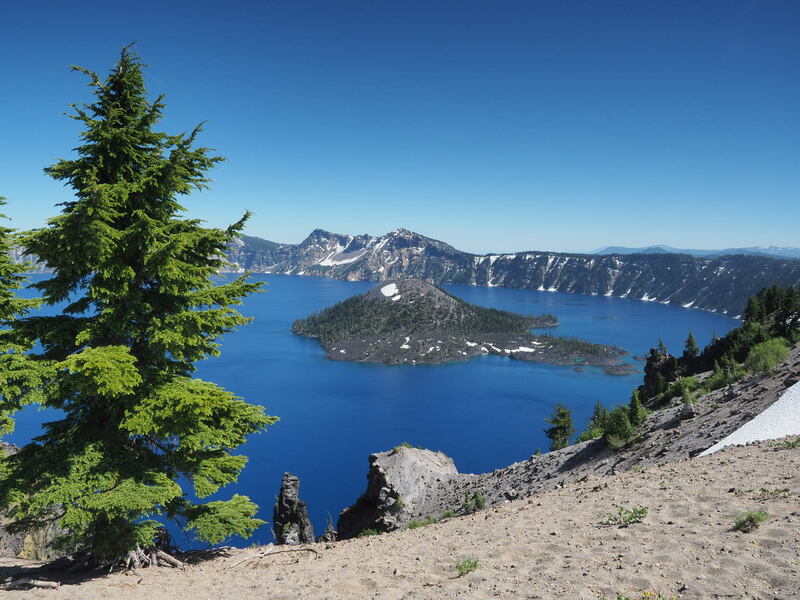 In other strange news, a southbound hiker reports there are no mosquitoes in Northern Oregon. We have had a bunch of them in Southern and Central Oregon and are skeptical of this report.